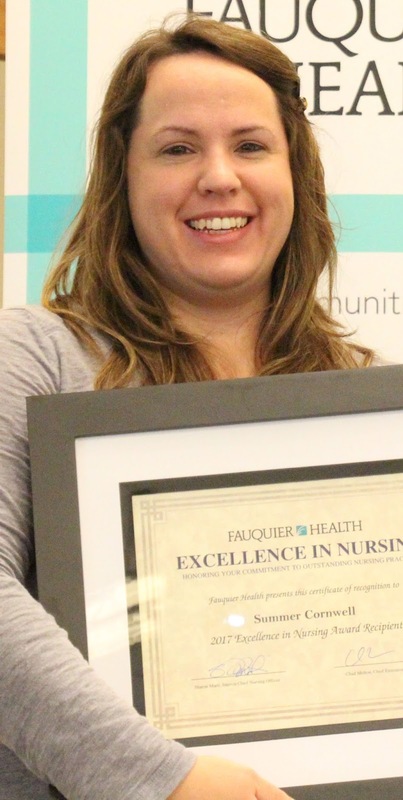 Summer Cornwell, RN, received the 2017 Fauquier Health Nursing Excellence award. Nurses provide selfless care to patients when they are most vulnerable. Fauquier Health employs more than 300 nurses, and each one is a critical member of the team. Every year Fauquier Health recognizes one special nurse for his or her expertise and compassionate care. Nine nurses were nominated for this year’s Nursing Excellence award: Debbie Brown, RN (Surgical Services); Summer Cornwell, RN (Medical/Surgical Unit); Jennifer Horste, RN (Progressive Care Unit); Patty Jeffries, RN (Case Management); Shana Jenkins, RN (Intensive Care Unit); Tonya Lee, RN (Progressive Care Unit); Emily Martin, RN (Progressive Care Unit); Jessica Randall, RN (Progressive Care Unit), and Kim Steves, RN (Emergency Department). This year’s recipient of the award for Nursing Excellence is Summer Cornwell. Cornwell joined Fauquier Hospital in June of 2006, where she worked as a tech until she earned her nursing degree in 2007. Cornwell soon developed into a strong clinical leader. She is active on the third-floor patient care unit as a primary pediatrics and resource nurse and has been a mentor to new nurses. Cornwell achieved her Clinical ladder III recognition earlier this year.